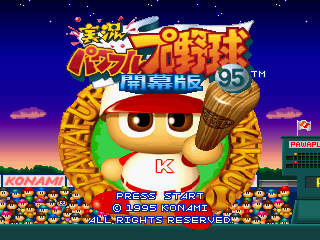 Jikkyou Powerful Pro Yakyuu '95 Kaimaku-ban (実況パワフルプロ野球'９５開幕版) is a baseball game for the Sega Saturn released as part of Konami's Jikkyou Powerful Pro Yakyuu series. It was only released in Japan. Main article: Jikkyou Powerful Pro Yakyuu '95 Kaimaku-ban/Magazine articles.